First line, "Dear Reader, I am Eliza. Not the girl, but the grown woman Eliza. It has been many years since I was called Eliza. I call myself Elizabeth now." 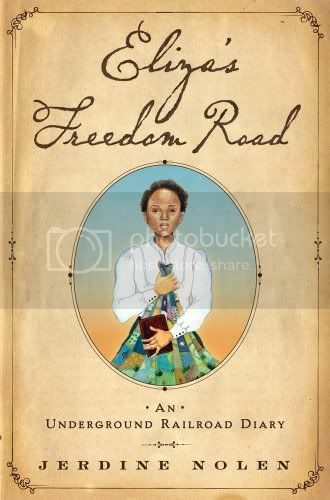 12 year-old Eliza lives as a slave in the 1850's in Alexandria, Virginia. As a house slave, she enjoys a comparative number of advantages but still must endure many injustices. She is friends with the house cook, and therefore eats well. Her half-blind mistress has taught her how to read (an unusual advantage for a slave) so that Eliza can read her letters and newspapers. Eliza even has a small diary that she is able to keep. Her mother has sewn her a beautiful quilt, with each quilt square representing a traditional folktale. But Eliza's mother has recently been sent away, and there is talk that Eliza may be sold next. She decides to make a break for it, and the bulk of the story, in diary format, is about her year-long journey northward to Canada by night. Alternating between stories of Eliza's escape and traditionally-inspired folktales, this book reminded me just a little bit of The Wanderer by Sharon Creech.